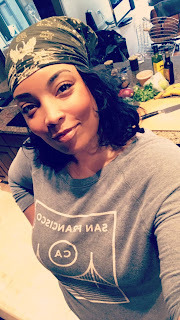 I might only get a chance to post a blog entry a couple times a week, but I'm cooking almost every night whether it's a full meal or just testing out a new ingredient. Check out what I've been working on below. You may see these up on The Kitchenista Diaries as a full recipe soon! Gave up the Bisquick and made homemade pancakes for my son. What a difference! Instead of buttermilk I used Greek Yogurt. 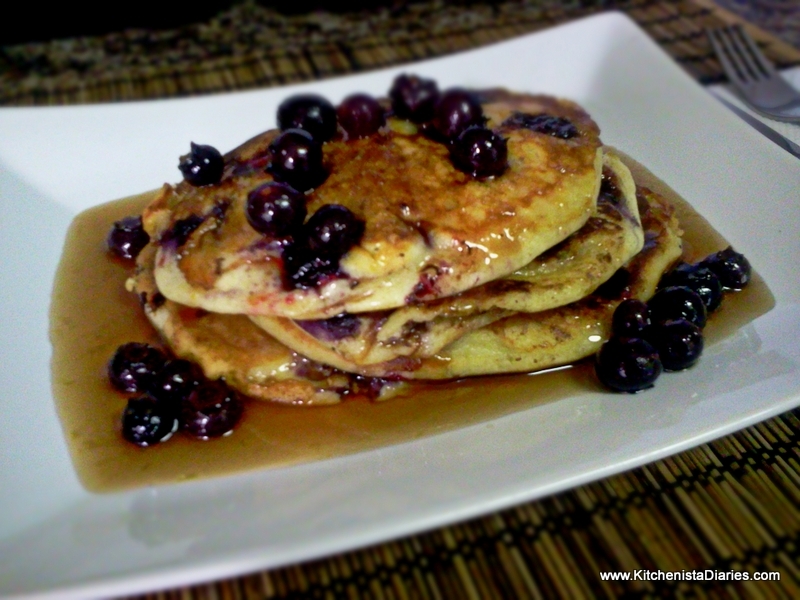 I added fresh blueberries to the batter while the pancakes cooked, and the maple syrup was warmed with more fresh blueberries, lemon zest and a touch of honey. Awesomeness. Almost makes me want to start getting up for breakfast on the weekends. Will try this one more time with a little more lemon in the batter to get it perfect. Every now and then I'll make dessert, usually when we have company. I used a recipe for lemon pound cake that called for Greek Yogurt. It was really good the first day but leftovers dried out quickly, so I'd like to try again with some modifications. 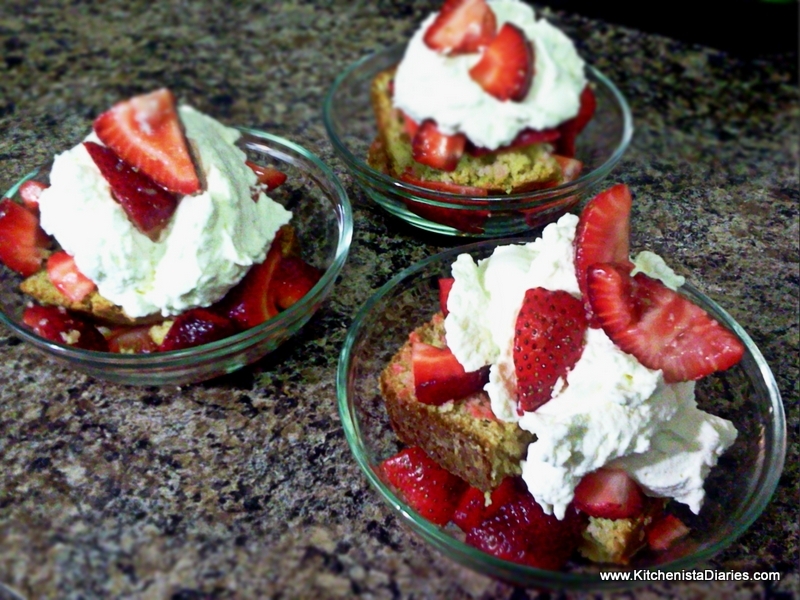 To serve, I topped it with fresh whipped cream and strawberries. Nothing short of amazing. Fresh wild salmon was on sale for $3.99/lb at the farmer's market, can't pass on that! I made a marinade with a base of soy sauce, lime, sesame oil, ginger, and garlic and then seared the salmon fillets. 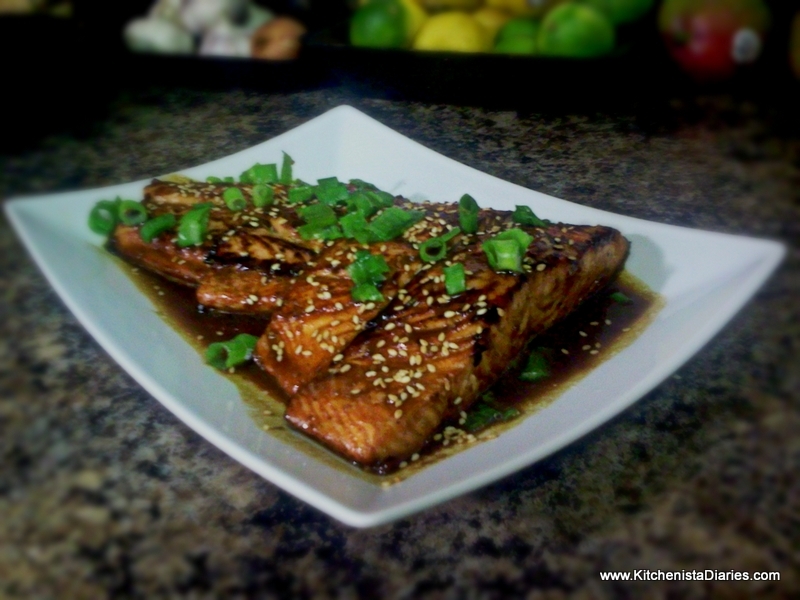 I used the marinade to make a glaze to finish off the salmon. This worked out fantastically and will absolutely be up as a blog post soon. Salmon used to be one of those dishes that always gave me anxiety. I never seemed to be able to get the perfect sear outside while medium rare inside, like the way one of my favorite restaurants prepares it. Now that I've practiced cooking it properly I've really enjoyed making it at home. Stir fry is a lot of fun but requires a ton of prep work! I like to do it when I have too many vegetables left over and need to clean out the fridge. I made this to go with the salmon above, although by itself it's a vegan dish. I made my own stir fry sauce with flavors similar to the glaze used on the salmon but highlighting the lime more. It was good fresh out of the wok and also as a cold salad the next day. I think adding some hot chili peppers would give it the perfect finishing touch.Originally I planned to use Japanese buckwheat soba noodles but they broke into a million pieces as soon as I dropped them in boiling water, what a mess. 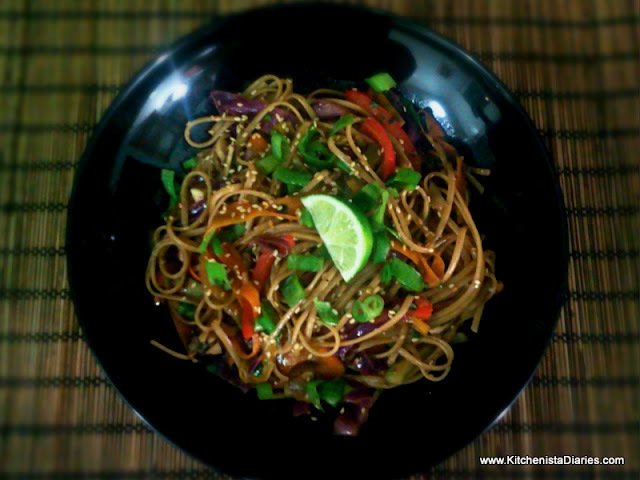 I ended up substituting whole wheat linguini. Delicious, but I'm really disappointed I missed out on soba noodles so I'll have to try this one again! 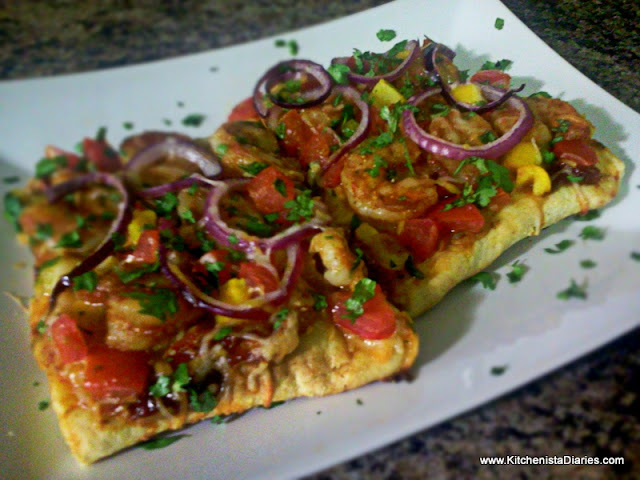 I have a calendar in my kitchen with healthy recipe ideas; May is a Mexican Flatbread Pizza with Cornmeal Crust. Sounded good, but I had my homemade chipotle barbecue sauce on the brain, so I tweaked their recipe into a BBQ shrimp pizza with tomatoes, yellow peppers, onions and a Mexican cheese blend. My son devoured it! Crust was just so-so in my opinion, so I'm going to keep looking for a flatbread crust that I'm more excited about. I tend to shy away from breads that require a lot of time to rise but from what I'm hearing it makes a big difference in taste, so I might have to bite the bullet and plan ahead next time I want pizza at home. Can we say barbecue sauce addiction? Couldn't resist using up the last bit of my sauce for Taco Tuesday. I marinated and sauteed chicken breasts and then added the barbecue sauce to make the taco filling. To top the tacos, I added queso blanco cheese and made a fresh slaw using red cabbage, cilantro, apple cider vinegar and lime. I'm pretty comfortable making slaws for my tacos but they've all included a creamy sauce like Mexican Crema or Greek Yogurt. I really liked the clean, bright flavor of using a simple vinaigrette this time. Delicioso! I marinated turkey tenderloins in homemade Jamaican jerk sauce and then roasted them. The jerk flavor was on point, took me right back to the Jerk Hut at a resort I visited in Ocho Rios. 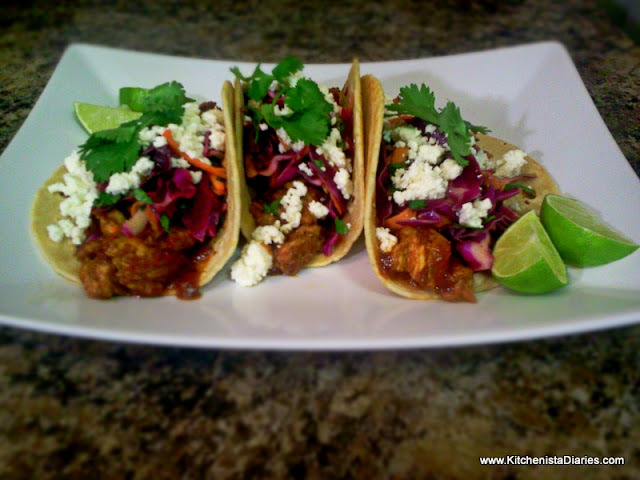 Using allspice berries and scotch bonnet peppers were key to the authentic flavor. Now that I've made a jerk marinade fresh there's really no comparison to buying store-bought marinades. The turkey did not take long at all to cook and it was incredibly moist, to my surprise. For some reason I've avoided cooking white meat turkey cuts thinking they would be dried out. I served the turkey over mashed sweet potatoes. For the other side dish, I braised fresh kale in coconut milk, ginger and garlic, added a little coconut cream for extra flavor and mixed in some roasted peppers and onions. 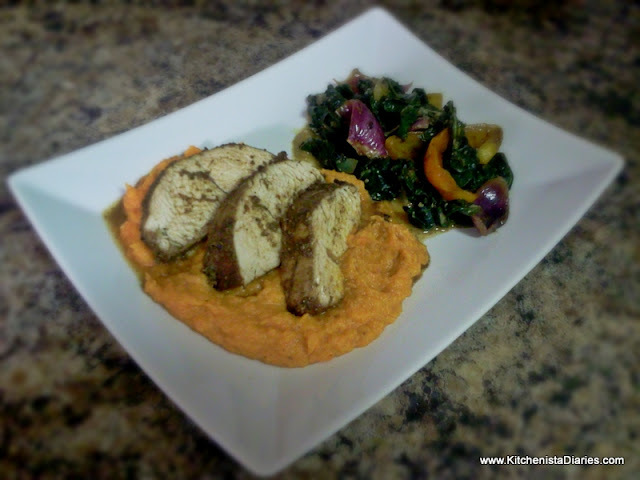 I think the coconut kale could be a fantastic vegan dish so I'm going to work on finalizing that recipe for the blog! The great thing about making your own sauces and marinades is having leftovers to use in another dish. As much as I enjoyed the turkey, the wings were even better. 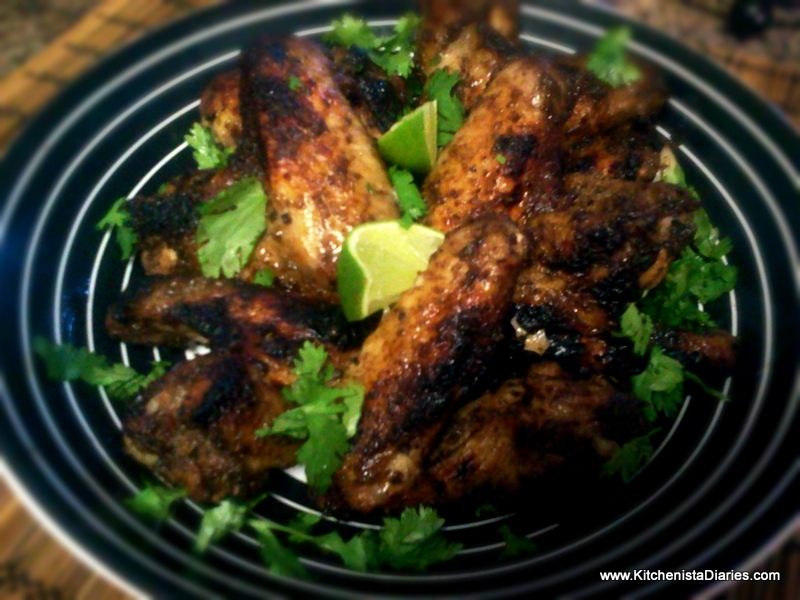 Using the Jamaican jerk sauce from above, I marinated then roasted chicken wings with a touch of honey and lime juice. I finished them off with fresh cilantro. Yum...just looking at these I am ready to cook them all over again! As you can see, sometimes new dishes work great the first time, but often I realize there is more to be done before publishing a final recipe. I make every meal an opportunity to try a new technique or ingredient. It's a fun and exciting way to challenge yourself. If you're learning how to cook, set goals for yourself, even if it's as simple as trying one new recipe a week. 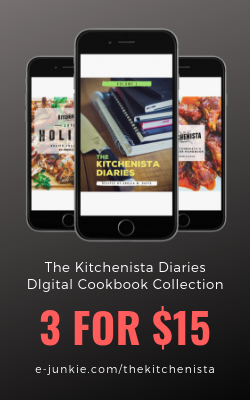 I'm really proud of how much I'm learning week to week in my efforts to publish recipes for The Kitchenista Diaries. It's a little like being in school...only I'm creating my own homework assignments. I've heard from a few people who have been supportive of my endeavor and feel encouraged to start cooking more themselves. That's awesome! I can already see the difference in some of the dishes I started photographing last year compared to what I'm able to produce now, so I'm here to tell you that practice does make perfect! P.S. Don't forget, you can always leave a comment here or email me if you have questions, feedback or suggestions!